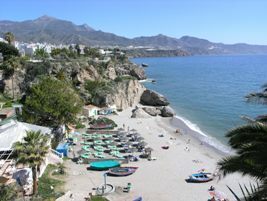 Nerja is the ideal place for a beach holiday, not least because it has no fewer than 10 beaches! This is the most famous of Nerja's beaches and is composed of a mix of fine sand and pebbles. Being 800m long and 40m wide, there is room for everyone even in high season. There are a wide-range of restaurants, cafes and shops on the beach front, many of which serve delicious fresh fish and seafood. Palm umbrellas and sunbeds can be hired here as well as pedalos in high season. There are also watersports and other activities on offer such as scuba-diving and day cruises along the coast. There are also several children's play areas with slides, climbing frames etc along the beach. Playa Burriana can be reached by road (there is plenty of parking but it does fill up in summer, particularly at the weekends) or by foot from the town centre, passing through the Parador area of town. 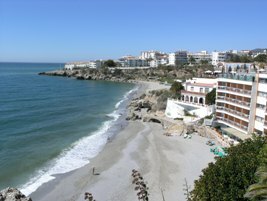 This is probably Nerja's second most popular beach, at the other side of town from Burriana Beach. It has been artificially widened to create a perfect beach for young children with shallow and generally calm water, and soft sand. Sun-beds and umbrellas can be hired here and there are plenty of restaurants and cafés in the vicinity. This beach is a real find! Just a stone's throw from the centre of Nerja but not stumbled across by the majority of visitors. It is small and secluded, with good sand and a beach bar. To get there, follow the cobbled walkway which leads off to the right of the Balcón de Europa, down the side of the Toboso apart-hotel. This can be found to the left of the Balcón and is reached via a fairly steep path behind a water fountain on the left as you approach the start of the Balcón promenade.This is a small and picturesque fisherman's beach, with a mixture of sand and small pebbles. The rocks on either side make it a sheltered beach and during the summer months there are sun-beds and umbrellas for hire. This is a very small beach in front of the Hotel Balcón de Europa, with softer sand than some of the other beaches in the area which tend to be more shingly. It can be reached either via the Hotel or from the Playa de Calahonda. This beach is found along the coastal promenade (Paseo de los Carabineros) which runs from the Balcón to Playa Burriana (although the last part of this is now closed due to unstable cliffs). It is therefore now only reached via a steep flight of 115 stairs from the end of Carabeo street. The difficult access and also the fact that it is only visible from a small viewing gallery makes this quite a secluded beach. This small bay lies between Carabeo beach and Burriana beach, and can be reached via steps from the end of Carabeo street. The coastal promenade which would previously have taken you from here to Burriana Beach is currently closed due to rock falls from the cliffs. However if the tide is out far enough you can walk straight from Burriana and around the rocks that jut out into the sea. This is a small beach in between Torrecilla beach and El Playazo, where the River Chillar reaches the sea. It is a sheltered beach with shallow waters, ideal for families. Chorillo beach is a cluster of 3 coves, fenced with huge rocks which make it the perfect spot for snorkelling. It can be reached from the coastal footpath (Paseo de los Carabineros) and is between Playa Calahonda and Playa Carabeo. This beach is at the most western end of Nerja and at about 2km long, it is Nerja's longest and most rugged beach, stretching right along to the Marinas de Nerja hotel complex It is a good place to go to escape the crowds, and the beach still has all the usual facilities such as showers and toilets (open only during the summer months) and beach bars along the front. Access to the beach is possible both by car and on foot. Add to this the other, more isolated, beaches along the coast close to Nerja and in neighbouring Maro, and you can see why Nerja is the perfect location for a beach holiday, whether you are looking for watersports and beach bars, small secluded coves or almost deserted beaches that can only be accessed by foot.